Although it's only possible to buy a Dell laptop online, the benefit is the ability to specify a machine to suit your own needs. The Dell Inspiron 640m features Windows XP Media Centre Edition and targets the home user. The bright styling of the chassis is finished in silver and black, with white inserts around the edge of the machine. Within the chassis is a 1.6GHz Intel Core Duo T2050 processor. This is a low-cost solution with a 533MHz FSB (Front Side Bus). Other Core Duo processors feature a 667MHz FSB. However, with help from 1024MB of DDR2 RAM, and a 5400rpm hard drive, a competent MobileMark 2005 score of 219 was achieved. The 640m excels in terms of battery life; under test we managed to run the Inspiron for 315 minutes away from a power source. Dell offers an extended battery (£58 inc. VAT), which ran for 531 minutes. The 14.1-inch Super-TFT display has a resolution of 1440 x 900 pixels (WXGA). Images appear sharp and colours vivid. The 16:9 aspect ratio is ideal for watching DVDs, and the width creates enough room to display several windows at once. Those seeking an all-round machine to play games on will be disappointed. An Intel 945GM graphics card supports the display, which is an integrated solution using up to 224MB of shared memory. While there's enough performance to deal with DVDs and multimedia use, games are out of the question, as borne out by a 3DMark 2003 score of 1487. The Dell has a very stiff chassis. The screen is firmly attached, and also offers rigidity. The keys are of a good size, and have a well judged amount of travel. The responsive touchpad has a vertical and a horizontal scroll option, making it easy to navigate large webpages and spreadsheets. A range of multimedia buttons on the front of the machine enable the control of features such as volume, and, because they are not covered by the clamshell, allow you to play your CDs without opening the machine. Those wanting to connect to the Internet wirelessly will be pleased to find an 802.11a/b/g Wi-Fi adapter, and connectivity is also boosted by the inclusion of Bluetooth, while 10/100 Ethernet is offered for wired solutions. A dual-format DVD rewriter is in place, and you'll also find a 6-in-1 card reader, enabling you to back-up work to various external mediums. 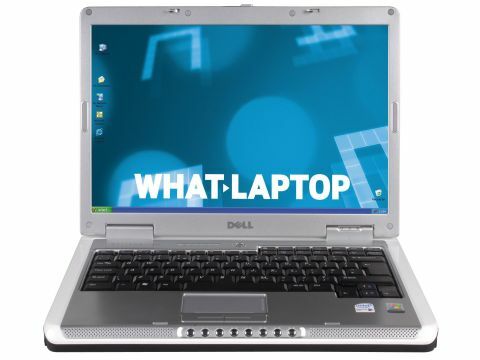 Although it doesn't offer the quickest processor, the Dell performed well in our benchmarks, and ran tasks without lag. It's a well-constructed machine, and offers plenty for the average user. Dell offers a wide range of warranty options and, in many cases, even specifies a three-year warranty by default. However, for this machine to come in under budget, you'll need to opt for the basic one-year collect and return warranty. This covers standard components, but not the battery.